When listening to radio in the car I do exactly what I would at home, channel surf. Generally I listen to Triple J but also switch between Triple M, 4ZZZ, and 612 ABC for something different. For a couple of months there was a period when every time I switched over to Triple M it seemed that they were playing The Spin Doctors. Now any normal person would pass that off as mere coincidence and leave it there, but if you've read this blog before you're probably aware that I'm not normal. I started to wonder exactly what type of songs were played on the station, did they play certain music at different times of the day to cater to a different demographic? More importantly how often do they actually play The Spin Doctors? To answer this I needed to log what songs were played, unsurprisingly I chose a solution that required electronics to log the RDS messages the station broadcasts. The method used was described in a previous post, Using a Raspberry Pi to Log Songs Played on a Radio Station. They do list recently played songs in their on-line streaming player, but I couldn't figure out a way to easily log them. Besides, electronics is more fun. I've since discovered a similar analysis was done by Daniel Nitsche in 2014. The logger was left to run for two weeks, generating a file with 273902 entries, on average logging what was being played every 4-5 seconds. Writing software to turn that into something useful was in my opinion going to take longer to do than editing the file by hand as there were intelligent decision to make along the way. There were small errors that needed correcting as well. For example, when the daytime presenters played a snippet of the songs to be aired in the next hour, that was also broadcast on the RDS message system. So it would appear they played the song and then played it again within the hour. That had to be corrected. I'm not saying this couldn't be automated, but for a one off, it's not worth it. After editing, the data showed that there were 2805 songs played over the two week period, about 8 songs an hour. That sounds about right. There's probably the occasional error in my data set, but I believe it's accurate enough to show any trends. There may also be some errors in the release year I've listed for the songs. Initially I tried to use an on-line music database to get the release date for each song, but that was way to slow and error prone. In the end I Googled each of the 868 songs to find out when they were released (doesn't take as long as you think, I averaged about 6 a minute). Then comes the problem of when a song was actually released. Some songs are released on the album but their release date is when the single comes out. I choose when they were first publicly available. So what can we actually learn from this data? I started with the histogram below to see the distribution of songs played. The oldest song played was "Sympathy for the Devil" by the Rolling Stones from 1968. Then there's a bit of a peak in 1971 before the bulk of songs from about 1980 to 2000. 1991 seems to be a massive year for music and unsurprisingly aligns closely with the active rock format the Triple M subscribes to. Billboard has a go at explaining 1991. The bulk of the songs played in 1991 are from the following classic albums. The next thing to notice is that there aren't many songs from the 2000's, but they do play a lot of recent music from the last 5 years. 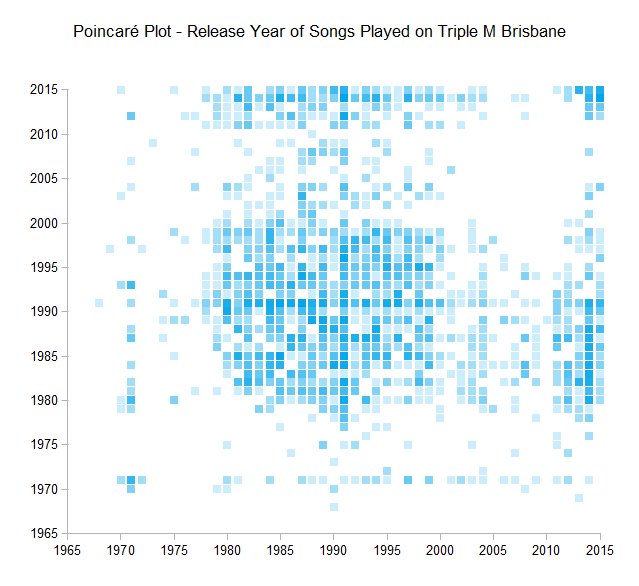 The next plot shows how the release years of songs are distributed over the two week period. Although you can see the information from the histogram reflected here, there isn't much too much else to see here. The last graph was a bit boring, but by taking the data and showing it differently we can learn some interesting things in the one below. By plotting all the weekday data on one daily graph, patterns begin to emerge. For instance, between the hours of 5 and 9 am it appears that there is a blackout on pre 1980 music. You can also see that songs are less frequently played between 6 and 9 am when the breakfast crew are doing their thing. When the drive show comes on from 4 to 6 pm you can once again see the drop off in the amount of music played to make way for the presenter. Between 6 and 7 pm there is a sports show that plays relatively little music as well. Then between 7 and 9:30 pm the focus seems to be on 80's music, this then changes to 90's music until about midnight. I assume they have data that says people who like 80's music are in bed by 9:30 pm. The data for the weekend shows similar patterns. After lunch, the sports coverage starts and the music stops. There's also a relatively dense block of new music between about 6:30 and 8:30 at night, this turns out to be a show on Sunday that plays a lot of new music. I also did up a Poincaré plot to see if any other patterns emerged, but the only thing obvious is the predominance of 1991. If you've never seen one of these before it's a graph of data that plots data point n against (n+1). They're very useful for finding patterns in binary files as well. So to wrap things up I looked at what the most popular artists were. I also looked at the most popular songs too. Ha!!!!! Proof I'm not insane*. Two Princes by Spin Doctors is the 9th most played song on Triple M. Coincidentally released in 1991. You can find my original logs here.